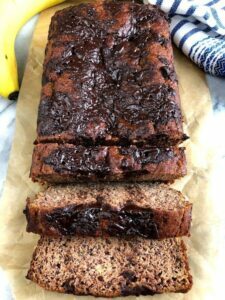 Easy and simple recipe for the perfect paleo banana bread, it comes together in minutes, is made with natural ingredients, and is the perfect healthy breakfast! Guys, I did something I’ve never done on here before. I took down a recipe. It was weighing heavy on my mind and I couldn’t get over the fact that I just was NOT happy with how it came out. It was also one of my first ever recipes I posted on here, so I’m giving myself some grace, and hey, the pictures were pretty horrible too! 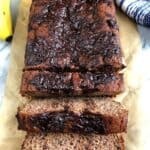 It was a recipe for paleo banana bread and I am not afraid to out myself because I think it goes to show just how far I’ve come in my journey with this blog. Every time I made that banana bread, I just wasn’t thrilled with the texture. The flavor was great, but it was just too moist for my liking so I’ve been on a mission to recreate a paleo banana bread that I can shout from the rooftops. TOM DIDN’T EVEN KNOW IT WAS FLOURLESS! And if you’re used to paleo baking, you know that textures and different densities of flours can be super hard to recreate that full-gluten baking. This banana bread is seriously easy to make too…the hardest part is waiting for it to bake in the oven! It can also be made nut free with the exchange of sunflower seed butter for almond butter! 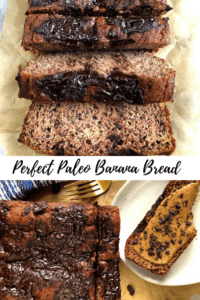 This paleo banana bread is perfectly soft, lightly sweet, and the easiest healthy banana bread to whip up for a crowd! Preheat oven to 350F and line a loaf pan with parchment paper or coconut oil. Stir in almond butter, coconut oil, honey and vanilla until well combined. In a separate bowl, mix together coconut flour, cinnamon, baking soda, baking powder and salt. Add dry ingredients to wet until fully combined. Pour into pan and bake for 45-55 minutes. Cover with foil halfway through to prevent top from getting too brown. Could I make this with bobs 1:1 GF flour? Thanks!